Watermelon Cupcakes Are a Great Summer Birthday Surprise! 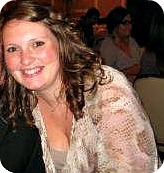 Help me welcome Pamela from Creating Barefoot! Pamela is a busy mom, Barefoot Books Rep, Blogger, Painter and an all around super mom! She is sharing with us how to make watermelon cupcakes. Curious? Read on! Oh and there’s a giveaway too! Read through to the end for details! I am beyond thrilled to be a guest blogger for The Whatever Mom! I have followed her blog since day one; and I have loved and related to each and every post. Before kids I was a complete planner, over-achiever and detailed person. Now that I have 2 very different boys constantly running in different directions, with different wants, and likes and tastes I have certainly come to take on the “whatever” mantra myself. My older son, completely unlike his mother, will not put a piece of chocolate to his mouth. No ice cream, no cake, no frosting, no candy bars. But put a bowl of fruit in front of him and he will devour it and ask for more. Of course not something I mind, though hard to lure him with bribes of sweet treats when I need to give him a little extra incentive. Like any new, over- achiever mom I slaved over his first birthday cake. A beautiful sesame street chocolate cake covered in yummy butter cream and sweet fondant Elmo faces. He wouldn’t touch it, let alone try a piece. I thought great, I won’t have to worry about the sugar high later. By his second birthday I felt bad he wouldn’t eat his own birthday cake. 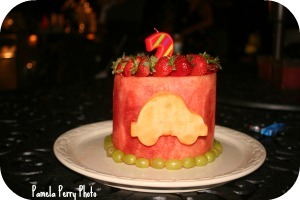 I knew I had to come up with something different and carved his cake out of a watermelon instead. He ate a great big juicy slice and loved every last bite of it. 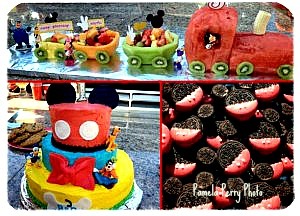 The first “cake” went over so well, the following year I made this for his Mickey Mouse Train Party. (We had a joint party so the cake on the bottom was for his cake- loving little brother). 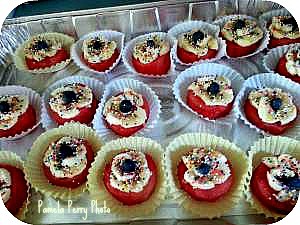 And that brings us to this year and my dilemma with sending in a healthy, child friendly snack for his birthday celebration at school. I wanted to make sure it was something he would eat and per the school guidelines it had to be healthy. Following my watermelon cake tradition I figured I could pretty easily make them into cupcakes! STEP 1: Cut watermelon into 1 inch slices. STEP 2: Use cookie cutter to cut out each circle and place inside cupcake liners. STEP 3: Cut two small slices of banana per watermelon slice. Mash them up a little to look more like frosting and place on top. STEP 4: Top with blueberry as the “cherry topper” and add a generous amount of sprinkles. 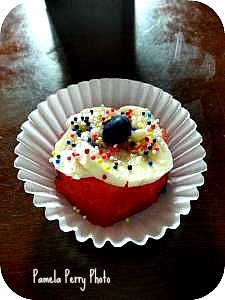 The teachers raved about the “cupcakes” and the kids ate them all up! It is a super healthy and adorable summer birthday treat! And now for the Giveaway! 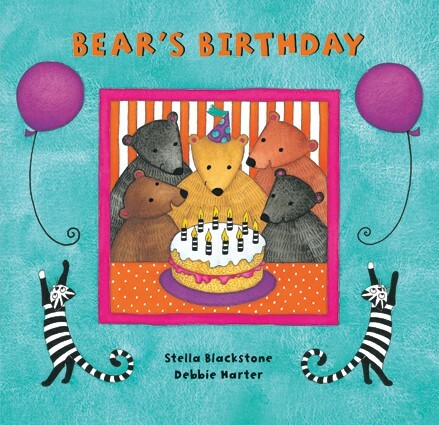 ONE lucky reader will win a FREE book from Barefoot Books! This giveaway is only open for 24 HOURS! Click the link below and follow directions in the box! Don’t forget to share! Comments Off on Watermelon Cupcakes Are a Great Summer Birthday Surprise! 0 comments on Watermelon Cupcakes Are a Great Summer Birthday Surprise!